The tweet went viral on Nov. 6: a photo of a lone rhinoceros, resting with its chin on the dusty ground of a wooden enclosure. Accompanying the photo, the caption read, "Want to know what extinction looks like? This is the last male Northern White Rhino. The Last. Nevermore." The photo struck a chord, though the rhino in it has been the last of his kind for years now. The second-to-last male northern white rhino (Ceratotherium simum cottoni), Angalifu, died at the San Diego Zoo in December 2014. That left a single male, Sudan, shown in the viral photograph, who turns 44 this year and is very unlikely to produce any more offspring. Sudan lives at the Ol Pejeta Conservancy in Kenya, along with the only two remaining females of the species, Najin and Fatu. Sudan technically belongs to the Dvur Kralove Zoo, in the Czech Republic, but was moved to Kenya along with another male in 2009 in the hope that breeding attempts in the rhinoceroses' native range would be more successful than trying to breed them in Europe. But natural mating attempts produced nothing. In 2015, veterinarians found that Sudan's sperm count is very low, and that both Najin and Fatu have age- and uterine-related conditions that make carrying a pregnancy impossible, according to Ol Pejeta Conservancy. The only hope, researchers now say, lies in rhino in vitro fertilization. Veterinarians have harvested eggs from female northern whites, including some who have since died, and have been collecting sperm from males since their numbers started dwindling. At the San Diego Zoo Institute for Conservation Research, scientists are racing to figure out how to fertilize a northern white rhino egg in the lab and transplant it into the uterus of a closely related subspecies, the southern white rhino (Ceratotherium simum). This isn't as easy as it might sound, the director of reproductive physiology at that institute, Barbara Durrant, told Live Science in 2016. Conditions in the uterus are different between animal species, and no one has ever developed an IVF procedure tailored to rhinos before. 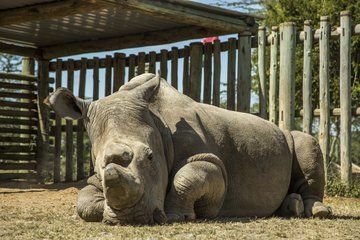 In the worst case, scientists are considering inseminating a southern white rhinoceros with northern white rhino sperm, to at least save some of the subspecies genetic diversity, if not the species itself. The northern white rhino once lived throughout northwestern Uganda, southern Chad, southwestern Sudan, the eastern part of Central African Republic, and northeastern Democratic Republic of the Congo, according to the International Union for Conservation of Nature. No individuals have been spotted in the wild since 2006. Both the northern and southern white rhino subspecies were poached to near-extinction by the late 1990s, but southern whites made a comeback after conservationists focused on breeding and relocating individuals to protected areas. As of 2010, according to the IUCN, there were about 20,160 southern white rhinos in the wild, mostly in South Africa. But poaching is still a problem. The practice of killing rhinos for their horns has actually increased in recent years, bolstered by a black market in traditional Chinese medicine, which uses the horn in concoctions meant to increase health and vitality — even though horns are just keratin, the same protein that makes up human hair and fingernails.